I have a friend who has geese, although she says the geese have her. Apparently, they wandered onto her farm from somewhere and won’t go away. People seem reluctant to cook with their eggs, but my friend makes killer brownies, and she claims the only Special Ingredient she uses is one goose egg in place of three hen’s eggs. I’m the only person she knows who is all about the goose eggs, so she brings me some, now and again. So what did I do? I made a quiche, using one of these babies. This could easily have been vegetarian, but we had a sausage patty going begging, so I chopped that up and bunged it in. I fried some portabella mushrooms with onion, garlic, and Penzeys Fines Herbes. And salt. Oh–I pre-baked the pie shell. 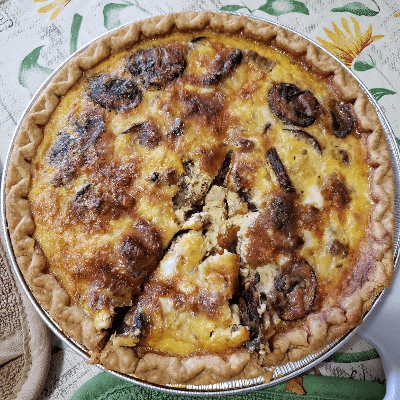 I arranged the sausage and mushrooms on the bottom of the pie shell, as if adding the egg and milk wouldn’t shove it around, right? After I poured the egg/milk mixture in, I sprinkled on what Charlie would call “a piss-pot full” of cheese. Baked it at 350F for a full hour. I wish we had had some asparagus, but, alas, we did not. How much milk to that goose egg? Well, I use the measurements I heard Julia Child give once: Break your eggs into a measuring cup. For each hen’s egg you use, add milk to raise the level to 1/2 cup. Since one goose egg equals three hen’s eggs, I broke one goose egg into my measuring cup and added milk to the 3/4-cup line. Perfect! I’m posting at Fatal Foodies today about a yummy soup. 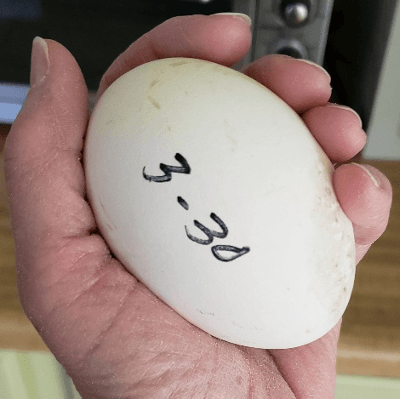 A WRITING PROMPT FROM ME TO YOU: Write about an unusual egg. This entry was posted in Food, Grab bag. Tagged recipe (sort of), vegetarian. I like the math/logic of the milk measurement – well done! A great little tidbit of measurements there! I’ll have to add that to my favorite cookbook. Is there any taste difference between goose and chicken eggs? Goose eggs have much larger yolks in proportion to white, so they’re richer. These geese are free-range, too. My friend says, boy, ARE they EVER free range! The recipe I always use is one egg to a half cup of heavy cream. I thought that came from Julia, too. I sent the Julia Child’s The Art of French Cooking books to my daughter in San Francisco who loves to cook. Sadly, I haven’t done much cooking in our brand new kitchen – harder to do from the walker, and cooking actually takes energy. We’re getting there – there will be low carb brownies one of these days, soon. Marian Allen would love to share..Our Woods are Good: They’re Full of Morels!